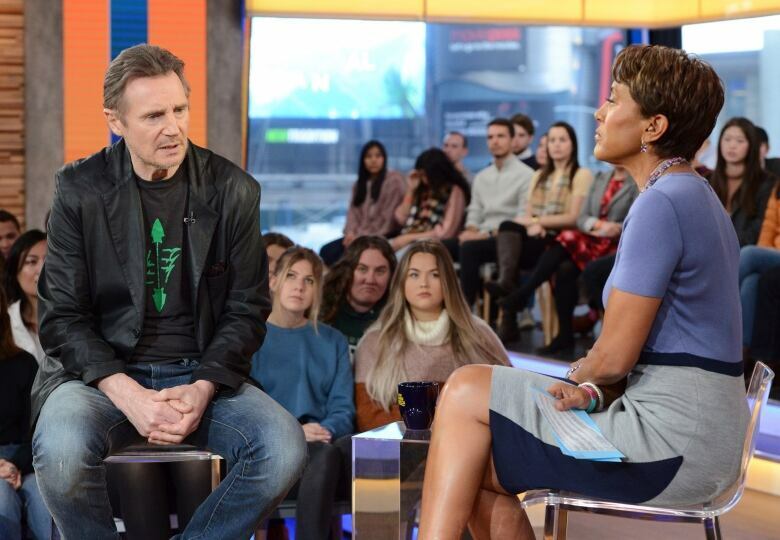 The red carpet at the premiere of Liam Neeson’s latest film was abruptly cancelled Tuesday afternoon, in the wake of comments the actor made about his racist reaction to a past incident. Organizers of the New York premiere of Cold Pursuit made the announcement just a couple hours before the event was supposed to start. The film’s screening Tuesday night will continue as planned. The 66-year-old actor appeared Tuesday on ABC’s Good Morning America, a day after the publication of an article in which he revealed that nearly 40 years ago he had sought to confront and commit violence against random black men after learning that someone close to him had been raped. The Oscar-nominated actor says he’s not a racist. However, he admitted feeling a “primal urge to lash out” before, eventually, becoming shocked by his behaviour. After that, he says he sought help from a priest and close friends. “Would you have had the same reaction if your friend had said it was a white man?” GMA co-host Robin Roberts asked. “If she would have said an Irish or a Scot or a Brit or a Lithuanian, I know it would have had the same effect. I was trying to show honour to my, stand up for my dear friend in this terrible, medieval fashion,” said Neeson, who is from Northern Ireland. Roberts said his words would nonetheless be painful for black people. The actor says we need to open up about these subjects because bigotry and racism exist. “We all pretend we’re all, you know, politically correct,” he said. Neeson has been promoting his new thriller, Cold Pursuit, in which he portrays a man who becomes a vigilante after the mysterious death of his son.